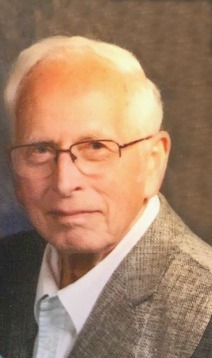 Rix Roger Landheer, age 83, of Lowell, formerly of Jenison, passed away Tuesday, September 4, 2018 at Spectrum Health-Butterworth Hospital under Hospice care. The son of Albert & Carrie (Frazee) Landheer, he was born on January 17, 1935 inGrand Rapids and graduated from Godwin High School. On August 5, 1961, in Grand Rapids, he married Eleanor J. "Ellie" Dertien and together they raised two children and enjoyed 57 years of marriage. For 31 years he worked at Rowe AMI and retired from Haworth after 13 years of service in 1997. Rix enjoyed deer hunting, fishing, gardening, woodworking, and painting, but found his greatest pleasure in time spent with his grandsons, especially cheering them on at sporting events. He was preceded in death by his parents; a stillborn son, Keith; and a brother, Al Landheer. Surviving are his wife, Ellie; their two children, Lisa Kooi of Norton Shores, and Bruce & Jamie Landheer of Cincinnati, Ohio; five grandsons, Josh Kooi, Zach Kooi, Joe Wokasch, Ty Landheer, and Cade Landheer; siblings-in-law, Ron Dertien, Wayne Dertien, Denny Dertien, Diane Burns, and Liz Landheer; and several nieces and nephews. Visitation with the family is from 10-11 a.m. on Saturday, September 15, 2018 at St. Peter's Lutheran Church, 310 E. Division Street, Rockford, where memorial services will be held at 11:00 a.m. on Saturday. Memorial contributions may be directed to the Memorial Fund at St. Peter's Lutheran Church. To send a message of sympathy to the family, sign Rix's online guest book, or to share a favorite memory, please visit: www.ChristiansenCares.com Arrangements were entrusted to Christiansen Cremation & Funeral Care, Greenville.